Malaysia AirAsia (MAA) and sister long-haul LCC Malaysia AirAsia X (MAAX) are shrinking their fleets in 2015 while adopting a new capacity and pricing strategy. Both carriers are trying to restore yields, which plummeted in late 2013 and 2014 due to intense competition and overcapacity in the Malaysian market. MAA is still adding some capacity by improving aircraft utilisation levels. But passenger numbers will likely remain flat as the focus on yields results in a reduction in load factor. Meanwhile MAAX has cut capacity across its scheduled network as part of a restructuring aimed at restoring profitability. MAAX was highly unprofitable in 2014 while MAA was the only profitable airline in Malaysia. MAA was also the only profitable airline among the eight carriers in the AirAsia/AirAsia X portfolio. This is the second in a two-part series of reports on the Malaysian market and the outlook for 2015. The first report focused on flag carrier Malaysia Airlines (MAS), including its upcoming restructuring, and the recent reduction in overall passenger numbers in Malaysia. The report will focus on AirAsia and AirAsia X.
AirAsia Group’s Malaysian subsidiary, MAA, ended 2014 with a fleet of 81 A320s, an increase of nine aircraft compared to the end of 2013. But seat capacity was up by only 3% and ASKs by 4% as aircraft utilisation rates dropped. MAA carried 22.1 million passengers in 2014, an increase of only 1.3% compared to 2013. This marks by far the slowest growth rate since the airline launched at the end of 2000. 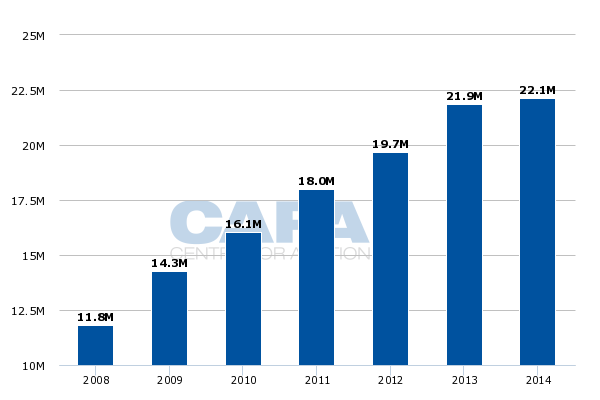 In 2010 to 2013 annual passenger growth ranged from 9.4% to 12.6%. AirAsia X Group’s Malaysian subsidiary, MAAX, ended 2014 with a fleet of 22 aircraft, compared to 19 at the end of 2013. Seat capacity increased by 33%. ASKs were up by 31%, driven primarily from capacity which was added in late 2013. MAAX carried 4.2 million passengers in 2014, an increase of 33.8% compared to 2013. Excluding the initial start-up period this marked the fastest growth since the airline was established in 2007. The 26.4 million passengers carried by MAA and MAAX combined represent about a 42% share of the approximately 63.2 million passengers that flew to, from or within Malaysia in 2014. As outlined in the first report in this series, total passenger traffic in Malaysia was up by about 5% in 2014. MAA and MAAX also accounted for 53% of the 50.1 million passengers that the AirAsia and AirAsia X Groups flew in 2014. All the AirAsia-branded airlines combined carried 50.06 million passengers in 2014, an increase of 9% compared to 2013. This marks the first time in the history of AirAsia that total passenger growth failed to reach the double digits. There are currently nine AirAsia-branded carriers, including two which launched in 2014 (AirAsia India and Thai AirAsia X) and one which launched in Jan-2015 (Indonesia AirAsia X). 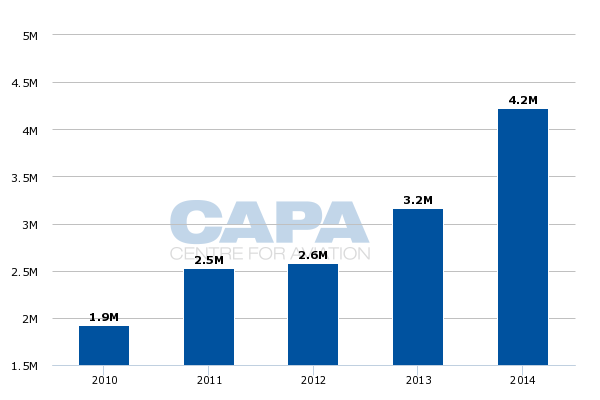 As CAPA previously highlighted, AirAsia became only the eleventh airline brand globally – and the first in Asia outside China – to surpass the 50 million annual passenger milestone. Notes: *Philippines AirAsia is combined with Zest AirAsia. The two affiliates are expected to merge in 2015. Of the eight AirAsia-branded airlines that were in operation during 2014, only one was profitable – MAA. The original AirAsia carrier reported an 8% drop in operating profits for 2014 to MYR854 million (USD261 million) as revenues increased by 6% to MYR5.416 billion (USD1.655 billion). MAA’s net profit dropped by 77% to only MYR83 million (USD25 million) but this was driven primarily by foreign exchange charges. 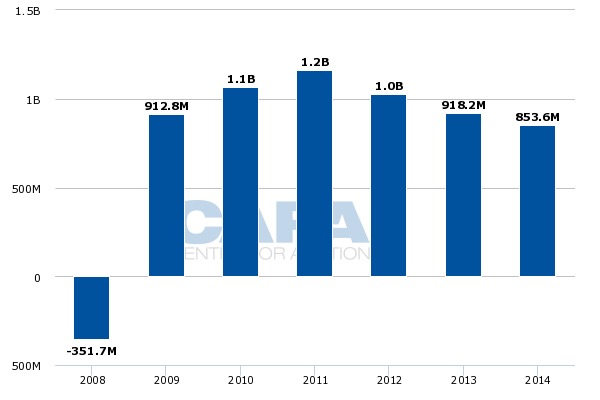 MAA’s annual operating profit has dropped four consecutive years. The 2014 result was the weakest since the 2008 global financial crisis. MAA’s profitability and margins, which have traditionally been some of the highest in the global airline industry, is expected to decline further in 2015 due to the launch of the group’s new aircraft leasing subsidiary, Asia Aviation Capital. In recent years a large portion of MAA’s profits have come from leasing aircraft to its affiliates. The AirAsia Group in late 2014 began the process of transferring the A320s operated by its affiliates to Asia Aviation Capital. Asia Aviation Capital aims to own 15 aircraft by the end of 1Q2015 and 45 aircraft by the end of 1H2015. Eventually Asia Aviation Capital will manage all the AirAsia Group aircraft except the aircraft at MAA, which will remain on its balance sheet. The AirAsia Group stated in its 4Q2014 results presentation that Asia Aviation Capital expects to generate net income of USD30 million in 2015 with an EBIT margin of 36%. These profits were essentially previously booked by MAA. As of the end of 2014, 91 of the AirAsia Group’s 172 A320s were operated by four affiliates. By the end of 2015 there will be 97 A320s operated by five affiliates. The AirAsia Group plans to keep its total group fleet flat in 2015 at 172 aircraft but MAA is shrinking its fleet by six aircraft to 75 A320s. The group is also shrinking its Philippines-based fleet by four aircraft while the other affiliates grow by a collectively 10 aircraft. Two additional have been allocated to the second iteration of AirAsia Japan, which plans to launch services by the end of 2015, while AirAsia India has been allocated three additional A320s for a total of six aircraft. Thai AirAsia has been allocated five additional aircraft while Indonesia AirAsia’s fleet will remain flat. The additional Japan aircraft are coming direct from Airbus while the India aircraft are coming out of the fleet in Malaysia. The Thai affiliate is taking three ex-MAA A320s and two aircraft directly from Airbus. The group overall has five A320 deliveries in 2015 but is selling three of its existing A320s and returning two A320s that had been leased by Zest. The group was originally committed to taking 17 A320s in 2015 but elected in 2014 to defer eight of these deliveries while also selling four of its delivery slots. While MAA plans to reduce its fleet by six aircraft in 2015 capacity is still expected to increase in 2015 as aircraft utilisation rates improve. MAA has not provided seat capacity or ASK guidance for 2015 but most likely growth end up in the mid single digits for the second consecutive year, which is a relatively low figure for the normally ambitious carrier. As CAPA previously outlined, MAA ended up with excess aircraft in 2014 after plans to sell several A320s failed to materialise. As MAA continued to take delivery of new aircraft the fleet grew at a much faster clip than capacity, impacting utilisation rates. MAA will have an opportunity to restore in 2015 its normal aircraft utilisation levels – and therefore reduce its cost base – as the excess aircraft are moved to affiliates. While MAA is expected to still increase capacity slightly despite the reduction in fleet size there may not be an increase in passenger numbers as the airline has adopted a new pricing strategy focusing on yields at the expense of load factors. This focus began in 4Q2014, driving a 17% increase in unit passenger revenue and a 13% increase in average fares. But the airline’s seat load factor dropped 7ppt to 78%, marking the first time the MAA fourth quarter load factor dipped below 80% in several years. 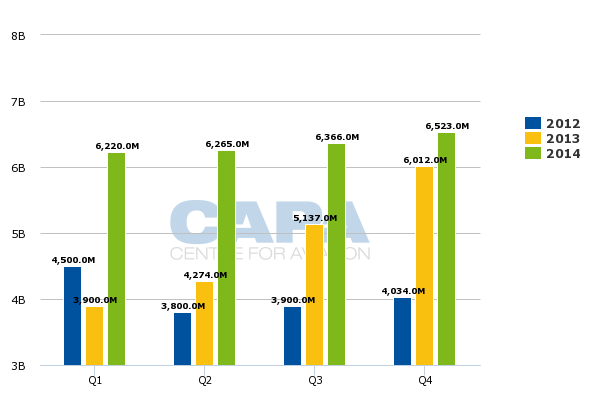 Passenger numbers were flat in 4Q2014 despite an 8% increase in seat capacity. The uptick in average fares marked the first year over year increase for MAA after six consecutive quarters of declines. But the average fare for 4Q2014 was still well below 4Q2012 levels and also below fourth quarter levels for every year from 2005 through 2011. The AirAsia Group believes the increase in fares and yields is an indication that rationality has returned to the Malaysian market. But its main competitors in the Malaysian market, Malaysia Airlines (MAS) and Lion Group affilaite Malindo Air, have not yet significantly adjusted their pricing strategy. At least for now it is AirAsia acting alone, resulting in the spilling of low-yielding passengers to other carriers as the market has resisted its fare increases. The 7ppt decrease in load factor in 4Q2014 was the largest year-over year load factor decrease for MAA in at least eight years. MAA plans to continue with its new yield-focus strategy in 2015. The AirAsia Group stated in its 4Q2014 results presentation that it expects a seat load factor of 74% in 1Q2015, which would represent another 7ppt year over year decrease, as it is “focusing on driving yields”. The group is taking a gamble that its competitors will eventually follow. AirAsia has particularly been hoping for an adjustment in capacity and pricing at MAS since the flag carrier entered a restructuring phase in Aug-2014. But as CAPA outlined in the first instalment in this series of reports the aggressive pricing strategy that MAS initially implemented in 2H2013, when it focused on growing passenger traffic and improving load factors at the expense of yields, has so far been maintained. The new MAS management team could eventually make adjustments but this is hardly guaranteed. MAA’s initial hopes for capacity reductions at MAS are also unlikely to be realised. As CAPA has previously outlined, the new MAS strategy envisions a focus on regional operations within Asia-Pacific. As a result capacity cuts that are likely to be implemented in 2H2015 will consist mainly or perhaps entirely of reductions in MAS’ long-haul operation. Competition in Malaysia’s short-haul market, which is the exclusive focus of MAA as it does not have any routes longer than four hours, could intensify further as MAS increases its focus on this market and Malindo continues to expands. MAAX is also unlikely to benefit from capacity reductions at MAS as MAAX focuses on the medium-haul market within Asia-Pacific. Its only route outside the region is to Jeddah, a destination MAS is unlikely to drop in its upcoming restructuring. MAAX also has adjusted its pricing strategy to focus on improving yields. The airline began restructuring its network and adjusting capacity plans in Nov-2014 after reporting dismal figures for the nine months ending Sep-2014. MAAX incurred operating losses of MYR308 million (USD95 million) through the first nine months of 2014 compared to operating profits of MYR71 million (USD23 million) for the same period of 2013. Its operating margin for the first nine months of 2014 was negative 15%; even MAS performed better than MAAX on this metric. MAAX was back in the black on an operating basis in 4Q2014 with an operating profit of MYR90 million (USD27 million) compared to an operating loss of MYR40 million (USD12 million) in 4Q2013. RASK or yield improved by 24% although average base fares dropped by 6%, an indication that conditions in Malaysia’s medium-haul market have remained highly competitive. MAAX still incurred a net loss in 4Q2014 of MYR168 million (USD50 million), 27% wider than its loss from 4Q2013, due mainly to foreign currency charges. For the full year MAAX incurred a net loss of MYR519 million (USD159 million) compared to MYR88 million (USD27 million) in 2013. Its annual operating loss was MYR219 million (USD67 million) compared to an operating profit of MYR31 million (USD10 million) in 2013. Annual revenues were up 20% to MYR819 million (USD244 million). In 4Q2014 revenues were also up 20%, including a 4% increase in revenues from scheduled services and a 173% increase in revenues from charters and wet-leases. Ancillary revenues were also up 12% compared to 4Q2013. MAAX stated in its 4Q2014 results presentation that it is now pursuing higher base fares as part of an effort to optimise capacity to improve pricing. MAAX aims to improve average fares by 16% in 2015 and is also targeting a 20% increase in ancillaries. Services to Adelaide and Nagoya have been dropped while frequencies to existing destinations have been reduced, primarily to Australia. MAAX stated that other turnaround initiatives include pursuing strategic partnerships with industry players and exploring new less competitive routes. The airline also continues to try to boost yields by growing third party distribution via online travel agencies and GDS. As CAPA previously outlined, MAAX also has lined up several charter contracts during off-peak periods when the airline has excess capacity due to frequency reductions. MAAX has been operating charters in recent years using its two A340-300s and one A330-200s. But all three of these aircraft are coming off lease in the coming months. MAAX decided in 2014 to continue its charter operation by using A330-300s freed up from capacity cuts across its scheduled network. MAAX’s fleet will shrink by one aircraft in 2015 from 22 aircraft to 21 aircraft as its takes two new A330-300s but returns its two A340-300s and one A330-200. The total AirAsia X Group fleet will grow by five aircraft to 31 A330-300s as its Thai affiliate adds five aircraft and its new Indonesian affiliate adds one aircraft. The long-haul LCC group is focusing expansion in Thailand and Indonesia, where competition on medium-haul routes is not as intense. In the Malaysian market AirAsia X expects ASKs to be up by about 5% in 2014 compared to 2013 levels. The marginal increase in capacity will be driven by flights added in 2014, particularly to North Asia, as AirAsia X is reducing capacity to Australia. MAAX already started to slow down its rate of expansion in 2H2014. MAAX ASKs for the full year were up a 31% for the full year in 2014 but by only 8% 4Q2014. The reduction in fleet and capacity at MAAX is sensible as the airline pursued expansion in 2H2013 and 2014 which proved to be overambitious. MAAX only operated a fleet of nine aircraft at the end of 2012. As a result the 21 aircraft planned for end-2015 still represents a more than doubling of the fleet over the last three years. MAAX’s rate of growth peaked in 4Q2013, when AirAsia X ASKs were up 49% compared to 4Q2012. AirAsia and AirAsia X founder Tony Fernandes said at a media event in Sydney on 12-Mar-2015 that MAAX will add back capacity to Australia by reinstating double daily flights to Melbourne, Perth and Sydney. Mr Fernandes also said MAAX is looking to resume services to Adelaide and launch services to Auckland, suggesting the recovery strategy for the long-haul LCC should be to expand and add flights rather than shrink. MAAX previously served Christchurch in New Zealand but dropped the route as part of a 2012 network restructuring that also included the suspension of services to London, Paris, Mumbai and Delhi. Mr Fernandes has since repeatedly stated the group has ambitions to return to Europe although former MAAX CEO Azran Osman-Rani, who was replaced in Feb-2015, always downplayed the possible resumption of long-haul operations and wanted the airline to focus on medium-haul routes within Asia-Pacific until it turned the corner and took new-generation widebody aircraft. Expected capacity cuts to Europe by MAS and lower fuel prices could potentially lead to a faster return to Europe for AirAsia X. But MAAX’s new interim CEO, Benyamin Ismail, has made it clear that capacity reductions and cost-cutting initiatives are still the short-term priorities. "For the moment for this year it's all about consolidation," Mr Ismail said in a 12-Mar-2015 CAPA TV interview. "To make sure we put ourselves back in the black in terms of profitability [and] ensure the routes we operate are optimising in terms of profitability." Given the recent losses and current effort to raise more capital MAAX is hardly in a condition where it should again be pursuing strategic expansion. It also does not have the aircraft to reaccelerate expansion following delivery deferrals which were announced in Nov-2014. Mr Ismail has talked about the possibility of deferring more aircraft but also has signalled the possibility of resuming expansion in 2016, including re-launching services to Europe, if MAAX succeeds at turning around and building up its cash position in 2015. Mr Ismail told CAPA TV that MAAX has the spare capacity to potentially resume service to New Zealand in late 2015 but it is also looking at waiting until early 2016 for launching Auckland. He also sees opportunities to potentially resume services to India and use India as a stopover for Europe. The current AirAsia/AirAsia X strategy for the Malaysian market of focusing on improving yields while reducing the Malaysia-based fleet makes sense. Watching MAS maintain capacity and an aggressive pricing strategy over the last several months is frustrating but AirAsia needs to ride out the storm. MAS will finally transition to its new structure in Jul-2015 and start implementing its restructuring plan. AirAsia may not get the capacity cuts it hopes for from the MAS restructuring as MAS is expected only to tweak its regional network within Asia-Pacific. But the competitive dynamics in the Malaysian market are likely to change as MAS completes its long overdue transition to the new company and the new management team takes over. Market conditions will remain highly challenging in Malaysia in 2015, particularly in the first half of the year. But the outlook could start improving in 2H2015, particularly if AirAsia maintains its new more conservative approach to capacity and pricing. Now is not the time to resume "strategic" expansion, even if others around do so. AirAsia still retains its first mover advantage and this should carry it through in the near term.